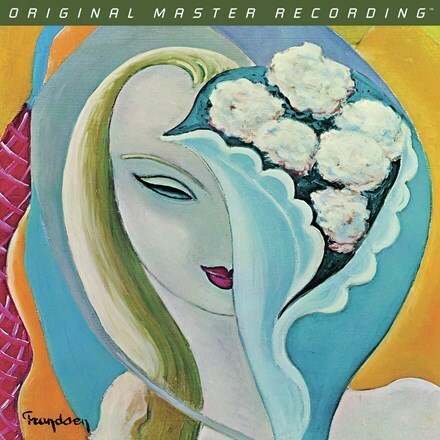 The reputation of Derek and the Dominos' Layla and Other Assorted Love Songs, their lone record, precedes it. Eric Clapton performing in the studio with Duane Allman, Bobby Whitlock, Carl Radle, and more for the only time. A batch of fire-pot blues, poignant gospel, and searing rock – all birthed from the leader's insatiable lust for his friend George Harrison's wife. Now, experience it all, and one of the most famous guitar solos and codas in history, in unsurpassed sound courtesy of this quintessential Mobile Fidelity reissue. Mastered from the original master tapes and pressed at RTI, Mobile Fidelity's 180g 2LP set exposes the brilliance of Tom Dowd's original production and the scope of the virtuoso musicians' playing. You've never been closer to the aching vocals, stinging leads, tormented emotions, or wowing intensity that grace every track. Clapton's tones emerge with unprecedented soulfulness. Afforded its own space in the mix, Allman's slide guitar passages crackle with urgency. All-important sonic components such as soundstaging, imaging, and dynamics transport you to the actual event. Mobile Fidelity's analog version testifies on behalf of why fans deemed Clapton god. Then, of course, there's the title track – crowned the 27th greatest song of all time by Rolling Stone. What to say about the outro – arguably the most famous, passionately penetrating, visceral, double-edged guitar solo in history. Clapton's strings weeping with longing, hope, regret, unrequited love. It deserves the best-possible sonic platform, and receives it here, on a pressing that brings Slowhand's every finger moment into great relief. Get inside Clapton's head, burrow into the conflicted emotions fluttering in his heart as he pines for his another man's wife, and in the process, produces an album that forever lives in the souls of anyone who's ever loved and lost. Clapton's pained yearning permeates everything here. Works such as the swampy "Tell the Truth," the pleading "Why Does Love Got to Be So Sad?," and blues-drenched "Have You Ever Loved a Woman?" attest to his raw-nerve discomfort, guilt, and desire. He leaves teardrops on the microphone stand and blood on the floor, singing and playing as if his life depends on it and if, by some miracle, the music will serve as both a confessional and apology to Harrison. It's all magnified by Clapton achieving a spiritual and sonic oneness with his band, which matches his high-stakes precision with a rolling, tumbling looseness. Allman adds firepower and achieves a still-unrivaled simpatico bond with Clapton, but each participant soars. Consider: The call-and-response, Sam and Dave-derived vocal exchanges between Whitlock and Clapton. Rich, creamy, Southern-stoked blends of R&B, blues, and soul. Vibrant tapestries in which the pianos, bass, guitars, and voices explode with ravishing fervor, naturalism, and desperation. Indeed, maybe a combo this great was only intended one shot in the studio. Perhaps the paralyzing degree of potency on display here, and the musicianship that remains the standard by which any blues-rock is judged, is meant to be preserved as one standalone record. Whatever the case, this is the analog version to own. 9. Why Does Love Got to Be So Bad?